A quick peek into some research on … the role Manufacturing Execution Systems (MES) play alongside ERP and PLM to help manufacturers improve their business and increase product profitability. I have researched, posted, and discussed the complementary and integrated roles of ERP and PLM numerous times. But the question would come up, “how does MES fits into the picture?” In my graphic I had placeholders for more execution-oriented systems such as MES, Maintenance Repair & Overhaul (MRO), and others. But I made a conscious decision not to complicate the already complicated subject of integrating the manufacturing systems ecosystem. Now that the industry has made progress in understanding how to integrate ERP and PLM, the time has come to address the role of MES. The details can be found in Tech-Clarity Insight: Integrating PLM and MES – Realizing the Digital Factory. For you engineers reading this, do you remember freshman year when they taught you how to calculate stress and strain on rigid bodies? Then as you progressed in your learning, you found out that it was a gross oversimplification and didn’t really apply to real world materials? Or for you brainier people when someone admits that the rules of physics and mathematics are just models that seem to work (for the most part) but aren’t really hard and true rules? Or for business-oriented readers, the first time you heard an accountant ask “what would you like the numbers to be?” instead of giving you a simple answer. I might be digressing a little, so I’ll make my point – sometimes you need to understand the basics without all of the other real-world complexity that makes it hard. But it’s important to get to that real-world understanding, because that is where the real understanding lies. End digression. PLM – PLM focuses on product innovation, and is designed to help manufacturers design, develop, and launch profitable products. ERP – ERP’s role is executing the business of manufacturing, supporting the business of planning and managing the execution cycle. I still like these definitions today, particularly the PLM one. The key difference in the ERP definition is the word “business.” While there are some companies that execute with ERP on the shop floor, for the most part it is used in planning for production and recording the results. Actual production is typically managed outside of ERP. Sometimes it is not automated at all, other times with some form of MES. So the picture was not yet complete. 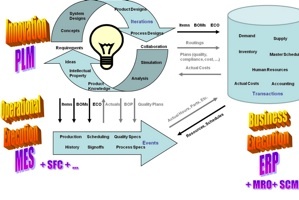 The Roles of ERP and PLM – Now with MES! So where does that leave us? With a need to integrate the manufacturing systems ecosystem into the reality of manufacturing operations. This is where MES enters into the picture. I had the opportunity to interview three companies that were willing to share their experience. One is a leading aerospace manufacturer who has significant experience with the integration but unfortunately wasn’t comfortable being identified, one is a Siemens electronics plant, and third is ATK Space Systems. Please read the report for their perspectives, they are worth hearing. I realize this is a long post, there is a lot to say and I have barely scratched the surface of the information in the report. So I will keep this short. Consider the role that MES plays alongside ERP and PLM and take the opportunity to integrate the product and production lifecycle. Whether you call that the “digital factory” or that term means something different to you, examine the value of increasing speed, improving quality, and decreasing errors by developing a synchronized manufacturing backbone that ties innovation, business execution, and manufacturing execution. 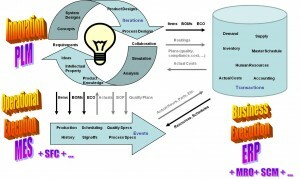 So that was a quick peek into some recent research on role that MES plays with ERP and PLM in a manufacturing software strategy, I hope you found it interesting. Does the research reflect your experiences? Do you see it differently? Let us know what it looks like from your perspective. Please feel free to review more free research and white papers about PLM and other enterprise software for manufacturers from Tech-Clarity.